The birth of the Innovative Finance Isa (Ifisa), set for April, looks likely to be met with enthusiasm by investors. Research indicates that the peer-to-peer industry could expect about £12bn of new funding this tax year, as a result of the new product – four-times more than the total invested to date in UK P2P. In February, we surveyed ThinCats members on their intentions on the Ifisa. Some 97% of respondents said they were interested in opening one – two-thirds of whom would invest their total Isa allowance in it. There’s clearly a degree of selection bias here, as we’re surveying our existing lenders, but we think there’s every reason to believe that the interest is much broader, given the strong performance of the asset class in general, and ThinCats loans in particular. Our own survey is borne out by a broader survey conducted last year by a major firm of accountants. It estimated that there were 2m Isa investors with a pool of £12bn in assets to take up the new Isa at the outset. Alongside these encouraging survey results, we are getting a steady stream of inquiries about the issue: what are our plans for the Innovative Finance Isa, and when will we be rolling it out? We, along with all other P2P lenders are in regulatory limbo while we await full FCA authorisation. The FCA have a difficult challenge to handle a large number of applications and authorise platforms whilst taking into account their need to promote competition. We hope that platforms with a comprehensive FCA application and a simple offering will have a better chance of early approval. Because the initial ThinCats offering will be sticking to the ‘traditional’ p2p method we have been using for SIPPs we are confident that it will meet the FCA definition of p2p. We are now working hard to be ready to launch our Isa offering as soon as our FCA authorisation is complete. As soon as we receive authorisation, we will make available an Isa product, where investors can select their own loans from the ThinCats platform. So you will be able to build your own portfolio, in much the same way as you do already, up to the value of £15,240, but in a more tax-efficient way. We are also working on a diversified Isa, where investors will be automatically invested across the breadth of the ThinCats platform. This will hit the market at a later point. As dates and the specifics of the Isa products become more concrete, we will of course communicate them to you. And, as ever, we greatly value your views on what you are looking for from ThinCats’ Innovative Finance Isa. A ThinCats loan has helped two former employees of a coach and taxi services company occupy the driving seat as owners. 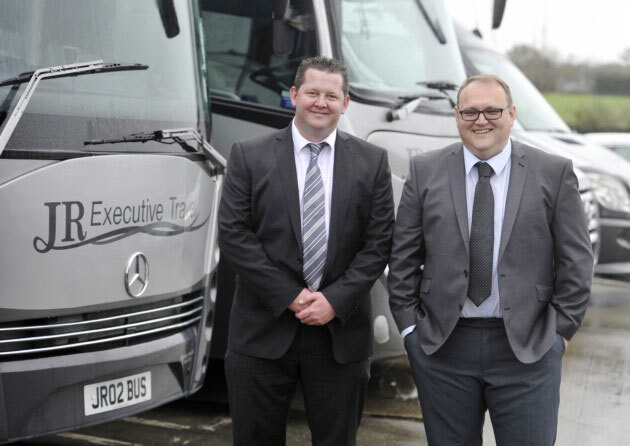 Co-owners Ian Tooke and Andy Fisk made the move at Ipswich-based JR Executive travel in November last year, with their management buy-out supported by ThinCats lenders. The two had been managing the business with little or no owner involvement for some time, and it seemed to make sense to both parties that they take the firm over, if the right terms could be agreed and funded. Ian and Andy had both certainly demonstrated they had what it took to run the business. Andy started as a driver at the firm, and worked his way up through the ranks to management level. Ian has had various roles within the motor industry, becoming group parts manager for three Toyota and Lexus dealerships, before joining JR Travel. They had the expertise and the experience – but they didn’t have the cash. Yet, as David said, the loan proposition was solid, underpinned by a business that was cash-generative and growing steadily. The final proposal, mediated by Sterling, was to provide £950,000 funding towards the total cost of the MBO of £1.8m. This being ThinCats, there was security against the loan: both the business property and the JR Travel fleet of 18 cars, mini buses and coaches. The full £950,000 was then underwritten, giving the borrowers extra confidence that they would raise the necessary sum. The auctions, across two loans, took place in September and October last year, and the money was drawn down in November, with the deal completed shortly after. JR Travel and its new owners are bedding in after the MBO. The deal underpins a firmer future for the company. It provides job security for its employees – the 35 taxi drivers, 17 coach drivers and support and management staff. The plan is to continue with the steady growth of the past few years, and pay down the ThinCats loan over its three-year life. The firm is even hoping to roll out its own booking app soon. After that? Well, there’s one owner of a nearby transport firm approaching retirement – who knows? Would JR Travel’s new owners use Thincats again? “Definitely,” according to Andy. When you lend through ThinCats, you do so in the expectation that the business will use those funds as described in the business plan, underpinning a decent return on your investment. Unfortunately sometimes that doesn’t happen, plans are unfulfilled, and the business finds itself in difficulties and defaults on the loan. Lenders in this situation want to recover their funds as soon as possible, and understandably get frustrated at the time this can take. Action is triggered if a borrower misses a payment, with both the borrower’s Sponsor and ThinCats being informed. The Sponsor is responsible for contacting the borrower to find the reason for the missed payment. It may be something as simple as a banking admin error, in which case no further action is taken. At the same time ThinCats issues a formal notice of default to the borrower, which is the start of the formal process. If there is a problem with the loan, then we work resolutely to resolve it. A business in default is given 14 days to rectify the default, and their Sponsor will be working with them throughout this time. While this is happening, ThinCats will also have taken a view on the likelihood of a satisfactory resolution, and we may be pursuing formal recovery action in parallel, within the 14 days, if it is concluded that the default event is unable to be rectified. As a secured lender, ThinCats can hold various types of security over the borrower’s assets, which can be enforced in the event of a default. A debenture or specific charge are the most common forms of security taken. Where a debenture is held as security, this can mean appointing an Administrator over the company or if a specific charge is held, a Law of Property Act Receiver can be appointed over the specific asset rather than the company. Where they have been taken, personal guarantees will also be enforced. While a borrower’s speedy entry into Administration may be the best way of resolving the situation to lenders’ satisfaction, this may not always be the best option to maximise recoveries. For instance, if a company enters into Administration, it may lose any licences or contracts that it may have as the formal insolvency causes them to become void. This could have a significant impact on the value of the company’s goodwill, which could significantly impact on the recoveries. In this case, our recovery team will work with the borrower on a scenario that ensures that the value of the loan security is maximised. If it is considered to be in the interest of the outcome for lenders, ThinCats’ recoveries team may look at a variety of restructuring options, including: sourcing new finance to ensure the loan is repaid, a novation of the loan to a financially stronger company, or a sale of the business and assets via an accelerated sale process. In cases where it is not possible to implement a restructuring process, our recoveries team then has to follow through the necessary statutory processes, potentially dealing with other creditors’ challenges and, with the owners, who have built up their business and will try and keep it afloat by any means. Navigating these contending claims again takes time. While we communicate with our lenders as transparently as possible, there are constraints: in a formal recovery scenario a Liquidator or Administrator only has to report periodically – generally, after their initial reports, this is every six months. Where we are working with the borrower on a restructuring strategy it is not always possible to provide full details of this to the syndicate members as there is certain information which is considered to be sensitive. For instance, a competitor or a supplier may be a member of a loan syndicate and therefore potentially privy to inside information, which could then be leaked into the market and impact on the borrower’s ability to trade. One advantage our lenders do have is that secured creditors approve the Administrators or Liquidator fees, and ThinCats ensures that these fees are restricted to a minimum in order to maximise recovery. To reiterate Jill’s point, we only operate in the interests of our lenders. When lending, it’s of course important to be aware of risks. With P2P loans, it’s also important to know what steps are taken to mitigate those risks. Managing a defaulted loan can be a convoluted business. Which is why it is necessary to have a professional team to navigate through it. The UK peer-to-peer market is on course to go through the £5bn this year, with the lion’s share being taken up by lending to SMEs, according to an influential report. Pushing Boundaries – 2015 UK Alternative Finance report by the University of Cambridge and Nesta, in partnership with KPMG, found that the UK P2P market grew to £3.2bn last year, up from just £267m in 2012. Of the total figure, £1.49bn was SME lending – the single component within P2P. New P2P lending to SMEs, excluding real estate, has been increasing steadily from just 1% in 2012, to 3% in 2013, 12% in 2014 and an estimated 13.9% in 2015. While the average business loan size is just £76,280, ThinCats’ average is about £300,000, demonstrating that we continue to be successful in targeting those larger firms which we believe will be more resilient in times of economic stress, and so giving our lenders a degree of protection. We will be introducing an automatic log-off security feature on the ThinCats platform. Users on the platform will be logged off and will have to log back in after 20 mins of inactivity, in a measure due to go live this month. Anyone who uses online banking will be familiar with such a feature. ThinCats will communicate a definite date for this as soon as it is finalised.